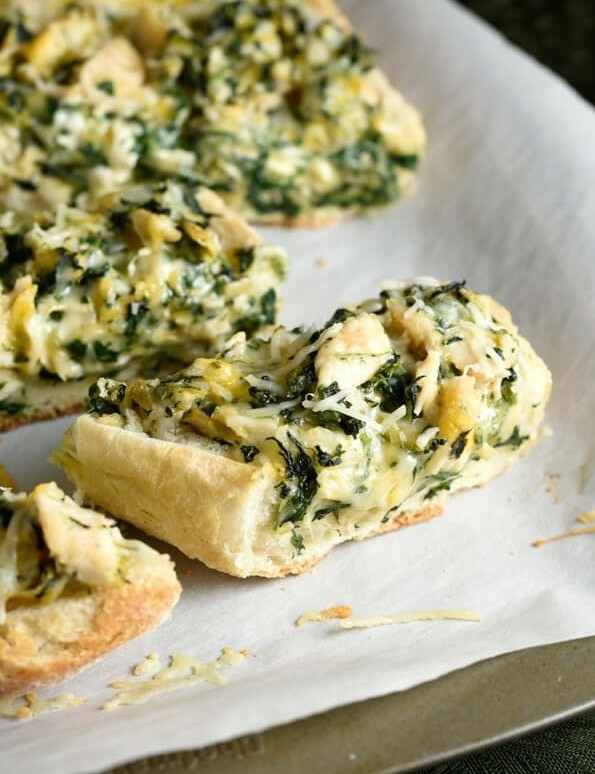 Spinach Artichoke French Bread Pizza – rotisserie or seasoned baked chicken is added to classic spinach and artichoke dip, then baked on French Bread, turning it into an easy and filling meal!! I’ve got another awesome recipe and cookbook to share with you today. Actually, I’ve got 100 awesome recipes to share with you today! Who doesn’t love those little gems, slow roasted all day, with the seasoned skin, and tender meat that falls off the bone? They’re so delicious, and more importantly, such a life saver after an exhausting day. If rotisserie chicken isn’t your thing for some reason, that’s ok. Substituting left over roasted, grilled, or fried chicken can always be done. Just use your best judgment! 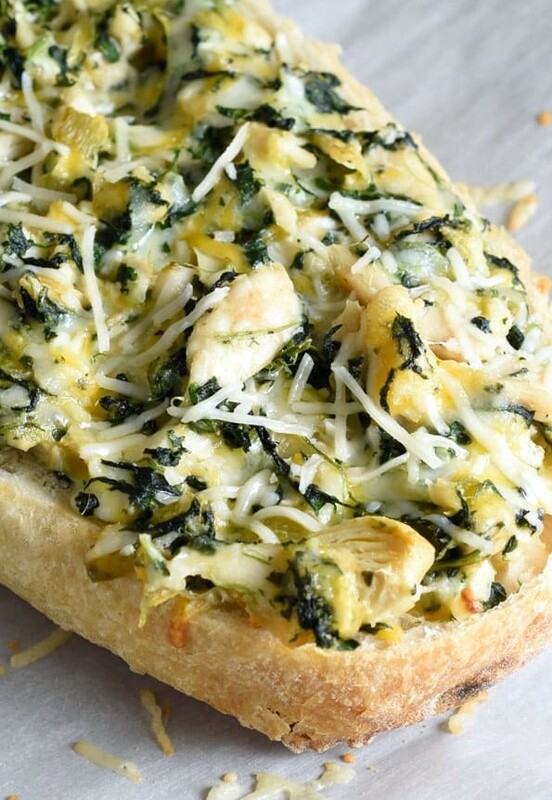 Rotisserie chicken is added to classic spinach and artichoke dip, then baked on French Bread, turning it into an easy and filling meal! Combine all the ingredients, except the bread, in a large bowl; set aside. Carefully cut the loaf of bread down the center lengthwise. Scoop out some of the insides, making a long well. Divide and spread the filling evenly between the two halves. Place pizza breads on a baking sheet and cook for 25-30 minutes, or until the cheese has melted and the tops are starting to turn golden brown. 0 Response to "SPINACH ARTICHOKE FRENCH BREAD PIZZA"